Instructional Sequence Matters shows how to make simple shifts in the way you arrange and combine activities to improve student learning. It also makes it easy for you to put the NGSS into practice. After explaining why sequencing is so important, author Patrick Brown provides a complete self-guided tour to becoming an “explore-before-explain” teacher. He explains that this teaching mindset helps students construct accurate knowledge firsthand, which is an important component of all science learning. The book focuses on two popular approaches for structuring science lessons: POE (Predict, Observe, and Explain) and 5E (Engage, Explore, Explain, Elaborate, and Evaluate). You get guidance on how to create your own 5Es that translate the NGSS. And you get ready-to-use lessons featuring either a POE or 5E sequence to teach about heat and temperature, magnetism, electric circuits, and force and motion. Throughout, reflection questions spark thinking and help you develop the knowledge to adapt these concepts to your own classroom. 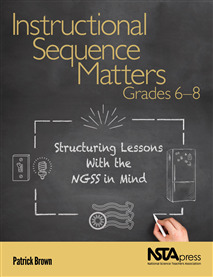 Instructional Sequence Matters is a one-stop teaching resource for developing lessons that support both the NGSS and contemporary research on how students learn science best. This text is useful to coaches and teachers alike. With many concrete examples, this book is easy to read and provides multiple examples of teaching with intention. Highly recommended!